A sense of excitement bubbles up on campus as student leaders and orientation staff return to campus and gear up to greet new students next week, and launch a year of community-building, mentoring, and leading across the College. This year’s orientation theme is Free to Explore, and it offers a full program of activities and info-sharing, beginning with 8 a.m. luggage drop-off for international students on August 22 and running through 5:30 p.m. Stepsinging after Convocation on the first day of classes on September 2. Among the varied events on the schedule one might find an immigration information session (for non-immigrant students), a shopping trip to Target, President Bottomly’s welcome to students and family members, a scavenger hunt to discover campus, placement exams, meetings with assigned faculty advisors, and a s’mores party. The complete program is available through Guidebook. This amazing introduction to Wellesley is the product of an intensive summer’s planning by the office of Lori Tenser, first year dean, and this year’s two energetic full-time student orientation coordinators, Hannah Lindquist ’15 and Ferni Cruz ’16. Before Orientation even begins, however, there’s a full week of activities to “train the trainers,” as it were (check the video on the entering students Web page). A big focus this year has been on leadership, leadership styles, and group dynamics. 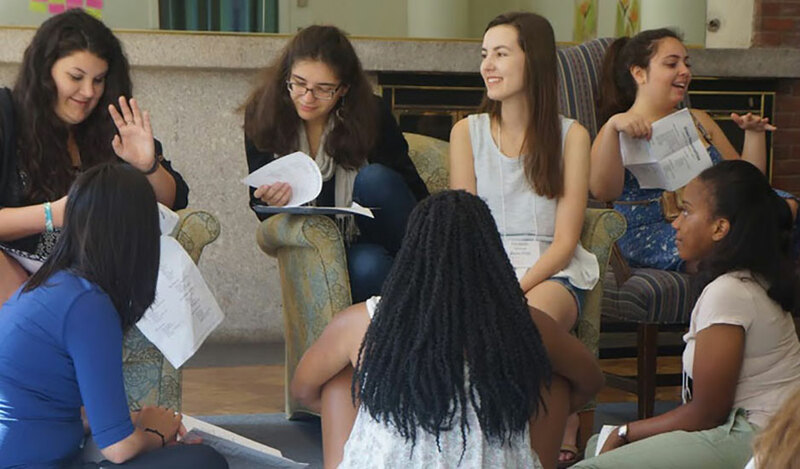 Wellesley is known for cultivating leaders, but this hands-on practical approach also facilitates Wellesley’s long-held ideal of exposing students to new and even opposing ideas and approaches with open minds and collaborative intent. For her part, Cruz says Wellesley has definitely allowed her to hone her leadership skills. “It's important to recognize and acknowledge that leadership is something that is constantly being developed. I've been fortunate enough to have had many opportunities to identify my strengths and weaknesses as a leader and to further build on those and put them into action,” she says. All student leaders arrived on August 17, and have been immersed in daily “Community Connection” workshops organized around residential areas, which will strengthen not only their overall leadership skills but their sense of cohesion in their living area. In the top photograph is a Bates-McAfee group meeting in a Bates Hall living room. Student leaders' week has also been filled with workshops on first-year developmental milestones, exploring gender identity, understanding shadow grading, how to create a great bulletin board, procrastination prevention, and intercultural communication, to name just a handful. Plus some fun, of course. Lindquist and Cruz recently dyed each other's hair purple and paired up in a canoe on Student Leader Fun Day. Other early arrivers back on campus are varsity athletes, with field hockey, volleyball, soccer, and tennis arriving August 20 and golf and cross-country arriving August 24. Athlete mentors, who help ease the transition of first-year athletes to college athletics, are part of the orientation crew of student leaders, which also includes first year mentors, College Government members, academic peer tutors, Slater advisors, resident advisors, and house presidents. New international students arrive for the international pre-orientation program on August 22, and all other new students—first years, transfer students, and Davis Scholars—begin orientation on Monday, August 25.